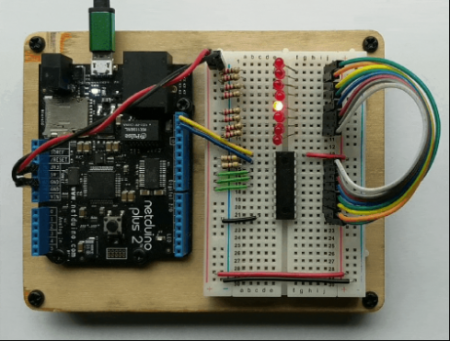 This project shows you how to use a MCP23008 I/O port expander to extend peripheral support seamlessly and control eight (8) leds using only two (2) control wires. 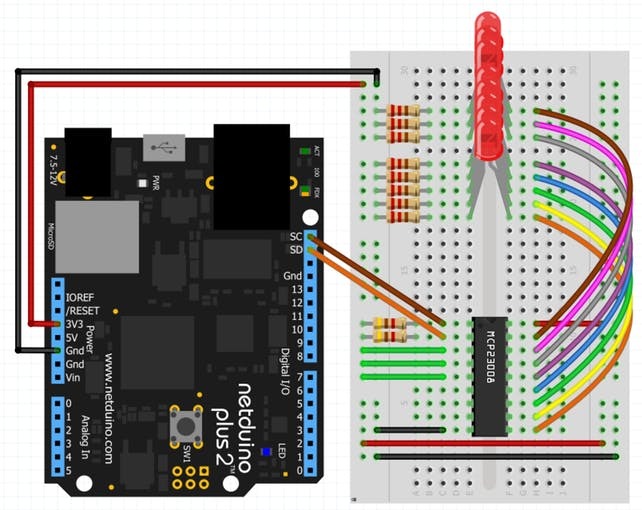 You'll code as if the LEDs are connected directly to the Netduino using Netduino.Foundation's Unified GPIO Architecture. The MCP23008 chip is an 8-bit (8 port) digital I/O expander chip that communicates over I2C. It provides eight (8) IP ports and can be used to add additional digital input and output ports to a Netduino. It can also be combined with up to seven (7) additional MCP23008 chips, providing up to sixty four additional ports. To connect the MCP23008 chip, consider the Pin Datasheet below. MCP23008 is a common integrated circuit in the hardware world and is the typical interface chip for hardware such as I2C LCD backpacks.. You can read more here. Note - all three address pins (three green jumper wires on the left of the chip) are pulled high. 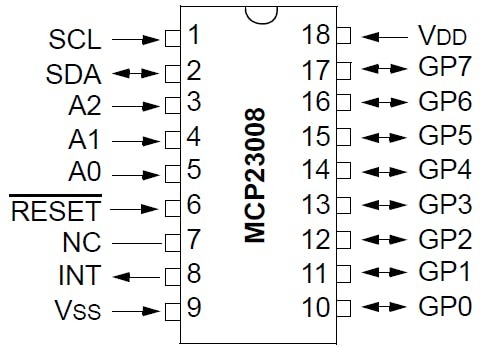 This specifies the I2C address for the MCP23008 - in this case the address is 39. Create a Netduino project in Visual Studio 2015 for Windows or the latest Visual Studio for Mac; name the project Blinky_MCP23008. 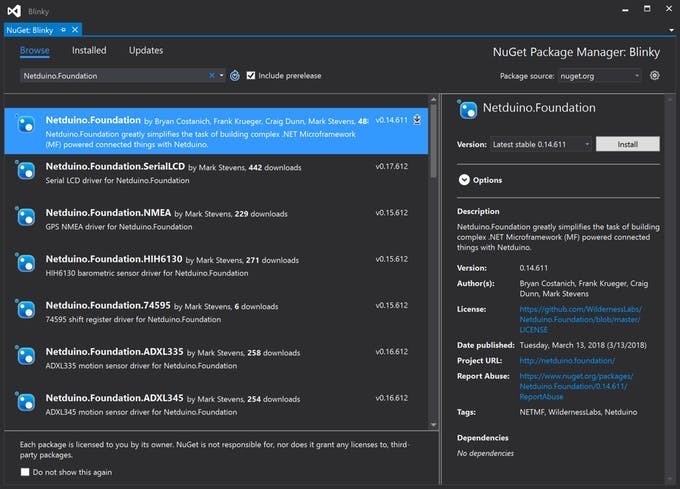 Right-click on your Blinky_MCP23008 project and click Manage NuGet Packages. In the Browse tab, search for Netduino.Foundation; it should be the first search result. Click the Install button. 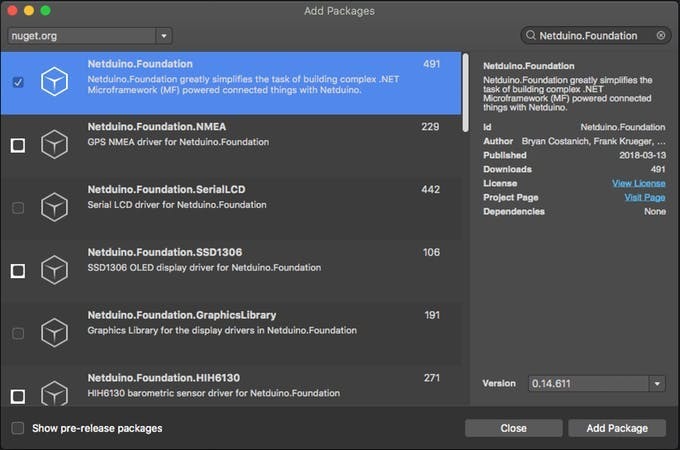 Now search for Netduino.Foundation.MCP23008 and add it to your project. Alt-click on your Blinky_MCP23008 project in the Solution Explorer, and click Add => Add NuGet Package to open the NuGet Package window. Search for the Netduino.Foundation package and click Add Package to add it to your project.